I’m totally crazy about crostatas lately. I’ve been making dessert crostatas since summer with whichever fruit was in season such as plums, blueberries, peaches and apples. All delicious! They are beautiful and rustic, and to me that means they don’t have to be perfect which suits me just fine because making pie crust is simply not my strength. 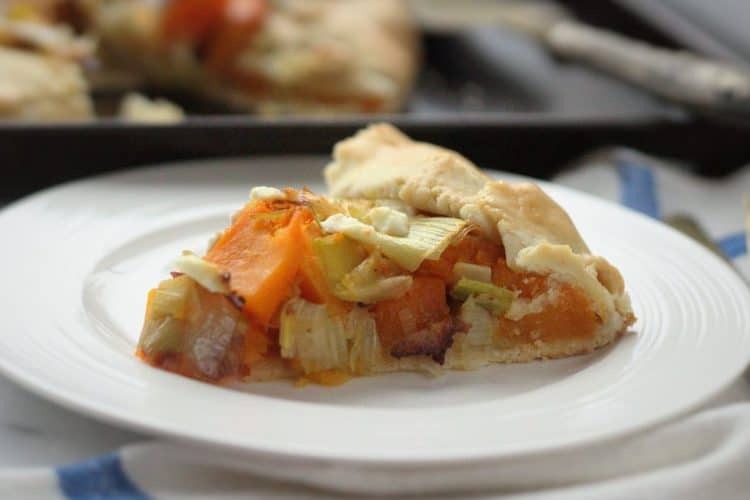 I generally prefer savoury foods to dessert and recently it came to me, why not use butternut squash in a crostata? Many people are intimidated by any type of pie dough, but I assure you that this recipe is a no brainer. I recently demonstrated how to make this dough during a cooking workshop in a local community organization in Montreal. A participant told me that she had never made any type of pie dough and asked why I did not simply buy a ready made pie crust. That day we were baking an apple crostata and she was totally blown away by the result. In fact, each time I see her she still talks about that crostata we made and can not believe that she made it herself! Here are a few simple tips for making pie dough. If you follow these easy steps, you should have good results. 1. Make sure your butter is chilled. And no, you can not melt your butter in the microwave in order to blend it with the flour. Cold butter is easier dispersed in the flour. 2. Use your food processor to make the dough in 2 minutes. After you add the water, the dough will wrap itself around the blade and form a ball (as shown). 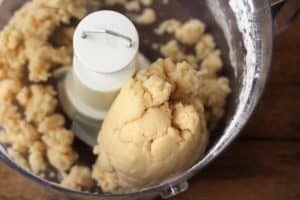 If you are not using a food processor, place your ingredients in a large bowl and use your fingers to cut the butter into the flour, then add water and bring the ingredients together to shape the dough. You will have the same results. 3. Transfer the dough onto a sheet of plastic wrap and shape into a disc. Cover and place in the refrigerator to rest for 30 minutes before rolling it out. That’s all there is to it. While the dough is resting you’ll have time to prepare your filling. 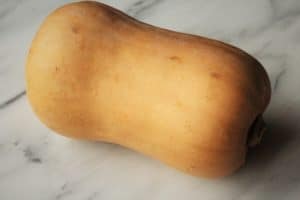 Now for the butternut squash. 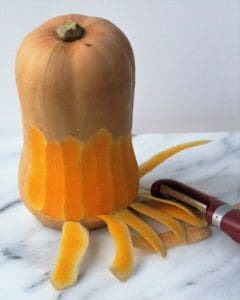 In my cooking workshops many people have told me that they find it difficult to peel this tough skinned squash. I’ll show you step-by-step how I peel and dice mine. 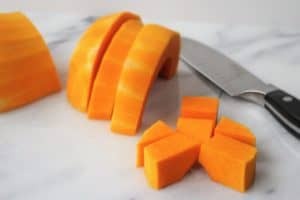 First, cut off a thin slice off of the base of the squash so the squash sits on a level surface. Next, use a vegetable peeler to peel the skin in downward motions. 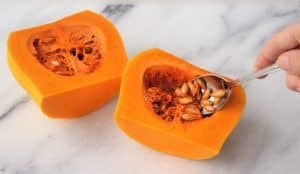 Next, slice the squash in half lengthwise and remove the seeds found in the bulbous part of the squash with a spoon. Slice into rounds approximately 1 inch thick, and finally cut each round into cubes. 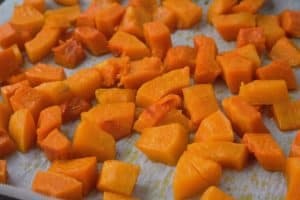 I’ve also seen cubed squash already packaged in the produce section of the grocery store, so that can always be an option if you want to avoid prepping your own squash. 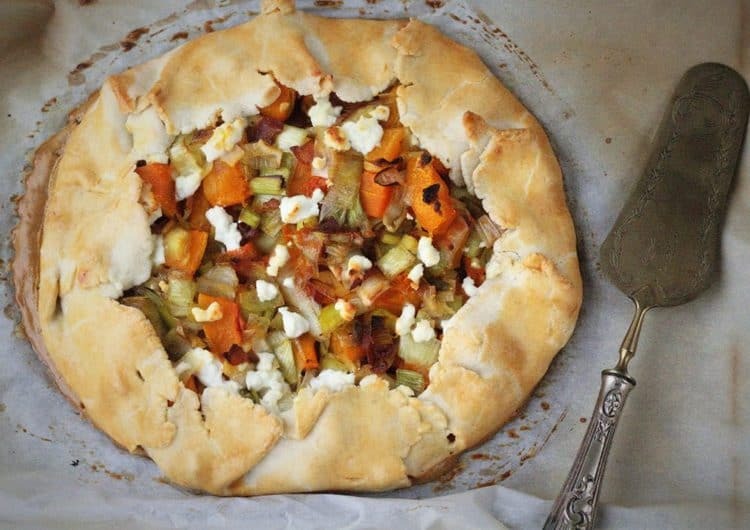 This crostata is a combination of some the best flavors of autumn: sweet squash and leeks, smoky pancetta and salty goat cheese. A match made in heaven if you ask me! I first tested this recipe with my toughest critics, you also know them as my kids. If they like it I know that it has to be good! 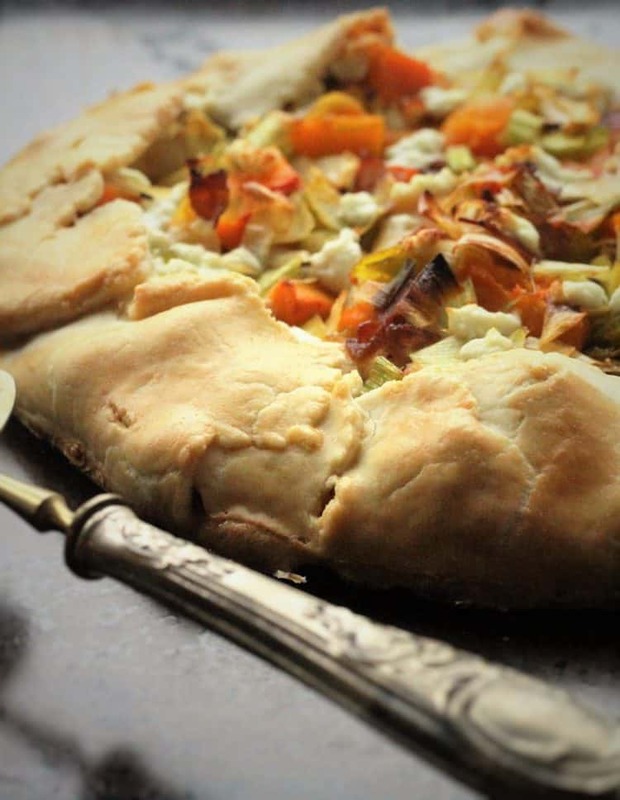 This savoury crostata is a wonderful autumn dish. 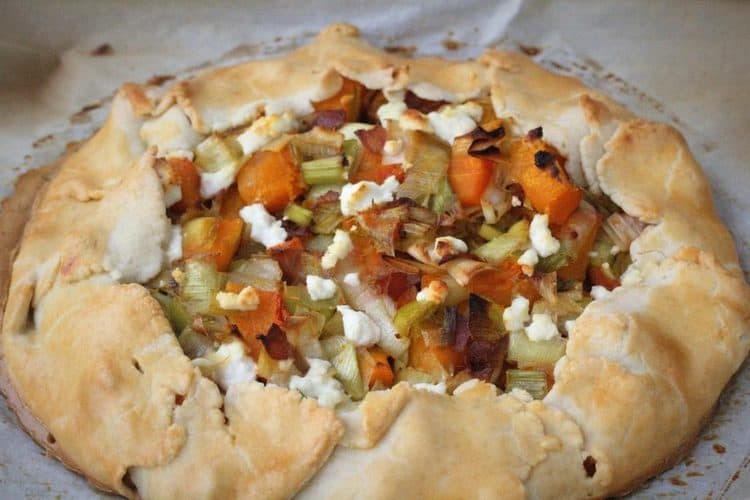 A flaky, buttery crust topped with sweet butternut squash, leeks and goat cheese. 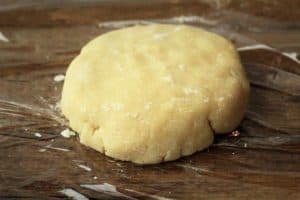 Begin by making the pastry dough. In the bowl of a food processor add the flour and salt and combine. Add the cubes of butter and pulse until the butter is completely combined with the flour. With the food processor on at slow speed add 2 tablespoons of water. If the mixture does not come together to form a dough, add the remaining tablespoon of water. Do not add too much water, you don't want the dough to become wet and sticky. When the dough is ready, it will wrap itself around the blade and form a ball. Transfer the dough onto a sheet of plastic wrap, shape into a disc, cover and place in the refrigerator for 30 minutes. Meanwhile, prepare the filling. Preheat oven to 350C. Cube the butternut squash as described above. 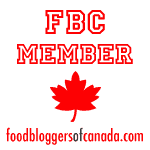 Place on a baking sheet covered with parchment paper. Add olive oil, salt, and toss until all pieces are coated in oil. Bake for 30-35 minutes until tender. In a large skill brown the pancetta until crisp. Transfer with a slotted spoon to a plate. In the remaining fat, sauté the leek for 5-6 minutes. If the pan becomes dry add a little more olive oil. Add thyme and season with salt and pepper. Transfer to a large bowl. 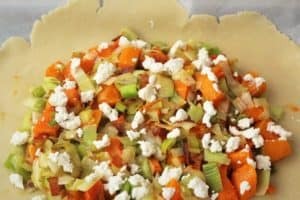 When the butternut squash is ready, add to the bowl with the leeks. Stir in the pancetta. Increase the oven temperature to 400C Cover a baking sheet with parchment paper to bake the crostata. 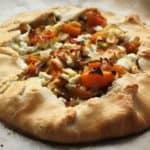 Remove the pie dough from the refrigerator. Lightly flour your work surface as well as a rolling pin. Roll out the dough to a 1/8 inch thickness. Wrap the dough around the rolling pin and transfer to the prepared baking sheet by unrolling the dough onto the parchment paper. Place the crostata filling in the center of the dough, leaving a 2 inch border. Dot the filling with small balls of goat cheese. 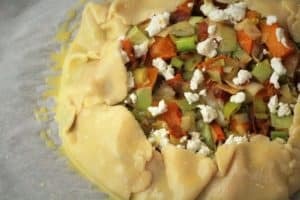 Fold the edges of the dough toward the center of the crostata, leaving the center exposed. Brush the dough with the egg. Bake at 400C for 15 minutes, then lower to 350C and continue baking for 20-25 minutes until the crust is golden.